Two Years! – Cin Cin, Let's Eat! 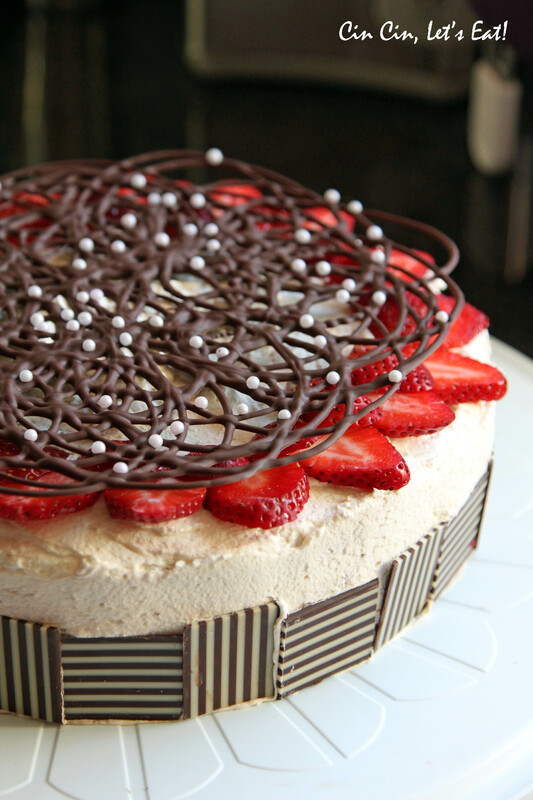 Buttermilk cake filled strawberry mousse and a thin layer of chocolate ganache. 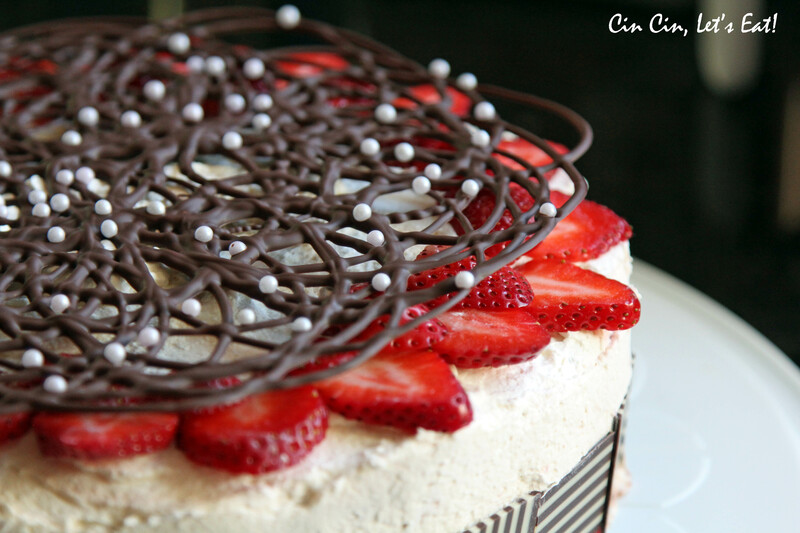 Mascarpone whipped cream frosting, topped with strawberry slices and a swirly chocolate piece. The chocolate squares were purchased at Cost Plus World Market. Put the chocolate in a heat-proof bowl. Add cream and corn syrup into a small saucepan and bring to a low boil over medium heat. Remove from heat and pour over the chocolate. Let stand for 1 minute, then slowly stir the mixture to blend well. Let cool until firm enough to spread. Put all ingredients into a large mixing bowl. 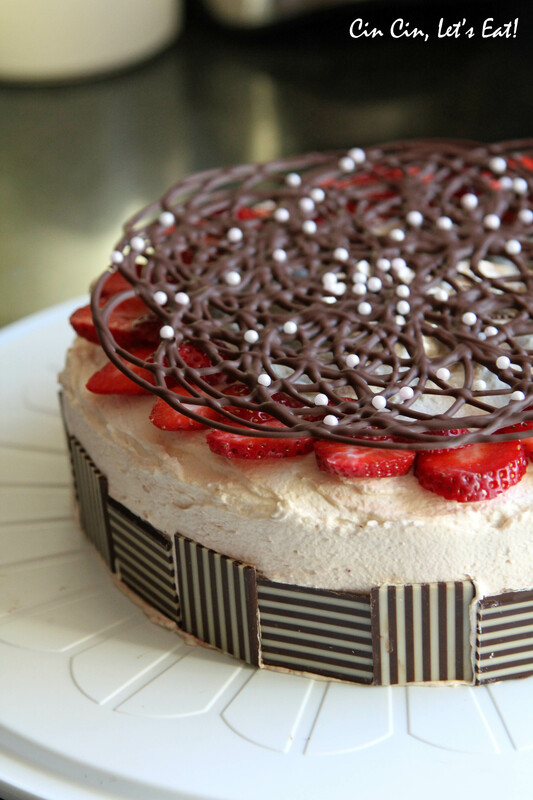 Using an electric mixer and whip until soft peaks form. First trace out the size of the cake (in my case, 9″ round) on a piece of parchment paper. Melt 2 oz of chocolate chips in the microwave or over a double boiler, stir until completely smooth. Add to a piping bag, snip off the tip to your desired size of opening. Apply even pressure and pipe/drip the chocolate out like you are drawing swirls and small circles. Do this fast and try not to go outside of the circle you traced. Wait 15 minutes before adding on sprinkles or edible pearls. Let the chocolate dry/harden completely before removing from parchment. You can refrigerate the chocolate the speed up the process. Congrats on your 2 yr anniversary! Beautiful cake! Happy 2 years! Congratulations. It’s always fun coming here and seeing your amazing food and wonderful travels. The cake looks worthy of a celebration. Happy birthday, Cin Cin!! You are aging well! 🙂 Is that your birthday cake? It’s gorgeous (like your creator)! Does the chocolate ganache go on top of the mouse filling? Where is the ganache?